Each layer in Studio Artist is composed of 3 RGB (red-green-blue) image channels and 1 alpha (A) channel. The RGB image channels define a color image. The alpha channel is an extra image buffer that can be thought of as an additional mask channel associated with the layer. Technically the pixel values in the alpha channel refer to the percent coverage of the color pixel, but thinking of it as a mask or stencil is probably an easier way to think about how it works. Studio Artist has a very flexible and configurable display environment, so you are free to utilize the alpha layer or turn off alpha view and ignore it depending on your workflow needs. You could also turn off alpha view and use it for non-conventional uses, like as an additional buffer to store a temporary selection mask or as a depth buffer or a spatial modulator for an effect. Some other graphics programs you may be familiar with will always have alpha view enabled, or even hide the fact that it is being used. One reason why Studio Artist provides the flexibility is that we allow for wet paint mixing visual effects that are not very compatable with traditional approach to alpha compositing. So if you are not doing a lot of layer compositing effects that require alpha to achieve, you are probably better off turning it off and enjoying the amazing wet smear effects you can create in individual layers. All of Studio Artist’s various operation mode effects also have internal Mix and Composite parameter settings as a part of the individual effects, so things that would typically require multiple layers to achieve in other graphics programs can be done in place in a single layer. 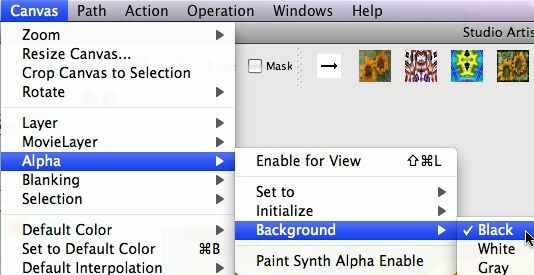 Studio Artist’s view system also allows you to view the current layer only, or to view all layers. Again, this is more flexible than other paint programs you may have used in the past. You also have the ability to turn off the status of individual layers. If you do this then they won’t show up when the display is set to view all. This allows them to be used as temporary buffers in PASeq effects or to store different versions of a drawing while working. Layer compositing controls will only affect the displayed view when you are in View All mode, they are ignored when in View Current Layer mode. 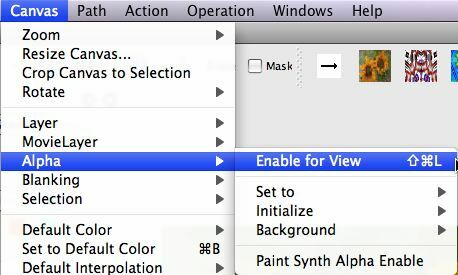 You can use the Canvas : Layer ; View All check menu to toggle view all mode on or off. You can also use the icon popup in the main operation toolbar to switch between the 2 view modes.. The individual menu commands associated with alpha are accessible in the main Canvas : Alpha menu. If you want alpha to be enabled for view all mode in the canvas you need to turn on the Alpha : Enable for View check menu. If you want the paint synthesizer to draw in the alpha channel when painting you need to turn on the Alpha : Paint Synth Alpha Enable check menu. When alpha view is enabled, a layer’s alpha channel acts as a mask for the color pixels of the layer. If an alpha value for a pixel is full off (a value of 0), then none of the color information for the pixel will show through. If the alpha value is set to 50% (a value of 127), then the color information in the pixel is mixed with the color information in that pixel location in the previous layer. If the alpha value is set to full on ( a value of 255), then none of the previous color information shine through the mask and the current layer’s color pixel information fully replaces the previous layer that that pixel location. If the entire layer’s alpha is set to Full Off using the Alpha : Set To : Full Off menu, then the layer will not be seen at all when alpha view is enabled. The color pixels in the layer are still there, and if you disable alpha view you will see that everything drawn in the layer is still there. If the entire layer’s alpha is set to Full On using the Alpha : Set To : Full On menu, then the layer will totally cover over and replace any layers already composited in the view. 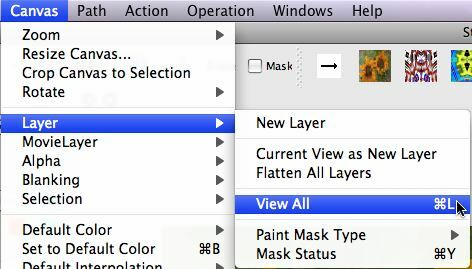 Studio Artist’s layers are stored in a list in the Layers Palette. The ordering of the list is the same as all other Studio Artist lists, it goes from top to bottom. This means that layers are composited in the view from the first layer at the top of the list in order to the last layer at the bottom of the list. There is a default background color that is specified using one of the check menus in the Alpha : Background menu shown below. If all of the layers in View All mode had their alpha channels set to full off then the only thing you would see in the view with alpha enabled would be the default background color you had specified,black in the case of the screen snap shown above. So, if you ever end up in a confusing situation where you see a black screen and you didn’t manually set the layer to black, that probably means you have alpha view enabled and your layer’s alpha channel is set to full off. An easy way to debug this is to turn off alpha view and switch to the current layer view and see if the color pixels in your layer reappears in the view. Again, unless you have a definite reason to be working with alpha channels for masking purposes i would suggest keeping the alpha view disabled to avoid potential confusion. For generic digital painting or photo manipulation in a single layer there’s really no reason to be working with alpha.